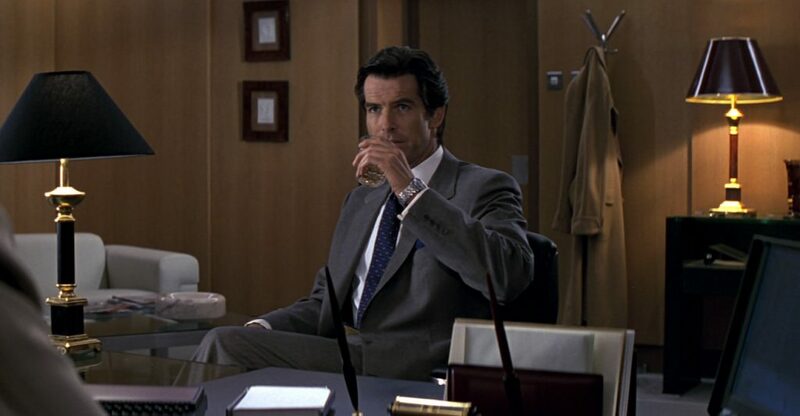 In GoldeneEye, Bond wears a Prince of Wales check two-piece suit to the new M’s office. The suit was originally made with a six-button waistcoat, but it was not used in the film. The jacket has a button two front in the typical Brioni cut, with a single vent, slanted pockets with flaps, and four buttons on each cuff. The trousers have turn-ups. The cloth is a blue and sand check made by Bower Roebuck in Yorkshire, as seen below. Bond’s ivory shirt is made by Sulka and has a moderate spread collar and double cuffs. The tie is a pattern of squares in shades of blue and gold, bringing out the colours in the suit. A puffed blue pocket square brings out the blue in the tie and the suit. On 19 December 2007, an example of this suit was sold at Christie’s in South Kensington for £19,200. Sulka. Interesting. I hadn't heard of them, to be honest, or them being involved with the Bond films. Foster and Turnbull and Asser were the only shirt brands I'd been aware of. Any other dress shirt makers involved with the Bond movies, Matt? Were all Brosnans shirts in this film from Sulka and what of his next movies? I assume the company has now passed into the annals of history? I mentioned Sulka in the entry about the blue suit. Sulka is no more. Brosnan wore Turnbull & Asser shirts for his next two films, and Brioni Shirts (with Turnbull & Asser ties) for Die Another Day. Daniel Craig wore Brioni shirts and Tom Ford shirts in Casino Royale and Quantum of Solace, respectively. But as far as other shirt makers, that covers all of them except for Dalton's. An interesting coincidence is that Sulka’s is mentioned in a monochrome episode of The Saint as the firm that makes shirts for Simon Templar. Roger Moore mentions the name to Colonel Latignan (Arnold Diamond). From what I can see and deduce, nothing of any discernable style or quality. Like something off the rail of some lower range department store! Matt, I'm a long time lurker and would like to say that I always look forward to new post. I do have a question about the appropriateness of wearing Prince of Wales check while in a business setting. My grandfather, who was the best dressed, most elegant man I've ever seen, was adamant that Prince of Wales should never be worn to the office as it was a sporting fabric. Was this just his own personal bias, or was it once a hard fast rule that has slowly eroded away? A Prince of Wales or a Glen Urquhart check is seen by many as not appropriate for business. This is the only time Bond wears a plaid suit to the office. A subtle plaid in dark tones is usually appropriate, or at least in grey tones. Here Bond wears a check in colours better suited for the country. 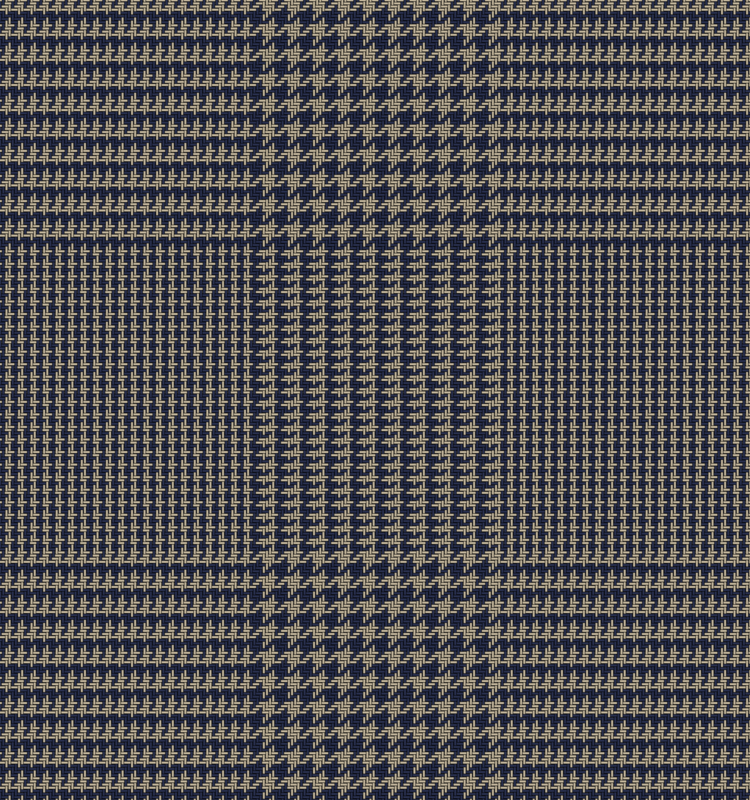 Q often wears a black and white plaid suit to the office, and I'll be writing about some of those in the future. Very nice suit, though far more 1930's movie star (or Remington Steele) than James Bond. A bit fussy with the pocket square (I much prefer the "TV fold" of Connery and Craig). And I agree that the check is not really appropriate for the office. This is why they should have used the waistcoat, IMO. It would have made it just a bit more appropriate for British sensibilities in business attire. Stuart, the difference is in the width. 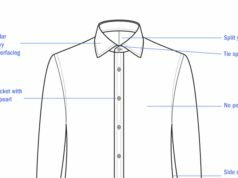 A point collar is narrower than a spread collar. On a point collar the tips of the collar do not usually sit under the jacket lapels, as they do not here. I was watching Goldeneye the other day and I noticed how low the button stance is. 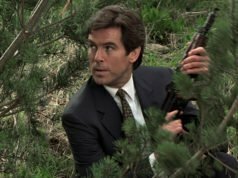 The suits in Goldeneye weren’t the best from Brosnan’s wardrobe, but they are much better than Licence to Kill. Another thing, the shirts from Sulka are terrible in this movie. Are we still scratching our heads about the Dalton shirts and suits or has someone found out yet? The lower button stance was still very popular in the 90s, though Brosnan’s button stance wasn’t that low. Brosnan’s suits were quite well proportioned. And we may never find out who made Dalton’s clothing. Most likely it came off the pegs from various sources. I think Brosnan always represents the best of 90s fashion. I think, overall, 90s suiting is overly roomy and padded. However, Brosnan’s tailoring is well done, while perhaps roomier than say, Connery, but equally stylish. 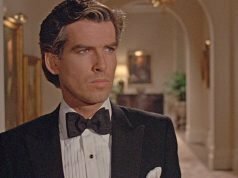 I lean towards the stylings of Connery, personally, but Brosnan (and to an extent, Craig) encourage me to wear fuller ties and suiting on occasion. I like variety in my closet. I just watched the film “Bugsy” recently, in which during the opening credits the titular character buys several shirts and ties from Sulka. Nice first office suit for Brosnan. It’s a pitty because it is the only one two-button, two piece suit he has worn in all his 4 movies, I guess. (I don’t count the tan suit in Cuba from DAD) Too many 3-button, I think. Hi Matt! 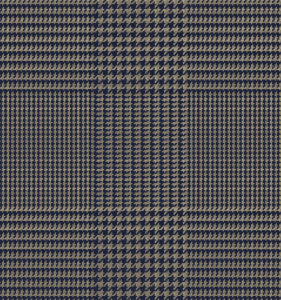 What do you think about the shirt fabric? Is it linen as I’ve read in another blog? It looks like cotton, probably poplin, pinpoint or royal oxford. I’ll be able to see more once the Blu-ray is released. Linen doesn’t make any sense for the setting. It doesn’t look like linen either. I think this is the best cut Brosnan wore from Brioni during his tenure. The lower stance of the two button front looks great and it looks more modern because of the two button front rather then the popular three and it is more fitted though the body that he wore on his other suits at the time. The country cloth doesn’t make sense for the setting though, black and grey colours would have been more London appropriate. Matt, why to do you think they choose to put Bond in really a ‘country suit’ for the formal office scenes in London here. In all of Brosnan’s other films he wears a dark suit in grey or blue to the office or in London. I think because Lindy Hemming was such a big fan of this colour combination on Brosnan, she used it whenever she could. The combination of warm and cool evens out to neutral. It could even be possible that Bond was supposed to be in the country or coming from the country to the office maybe. I can see the colour combo looks good on Brosnan, but he would have fit in better wearing a darker city suit. It’s not really a country suiting, even though the colours are more country-like. True, It is almost a cross between, it could work in a country setting. It looks mid-light grey from a distance. it’s still a lot lighter then you would see regularly in that kind of office setting in London. Not a good look for Brozzer, yet I love how the colours are all tied together. So many various shades of blue in this outfit that work beautifully when matched with each other. Even his Seamaster is brought out in this photo. The suit looks like more of a taupe colour from a distance. Sand and blue really come together to make a taupe really. In studio stills it looks more a taupe grey.